A delicious Maharashtrain breakfast, Misal Pav made as a one-pot recipe in the Instant Pot. Misal Pav is a wholesome meal, that can be enjoyed as a nutritious breakfast or brunch. Misal is a spicy sprouts curry cooked with onions, tomatoes, ginger, garlic and coconut. This is then topped with onions, lemon juice, farsan and enjoyed with pav (dinner rolls). Mumbai is famous for it’s variety of street foods. 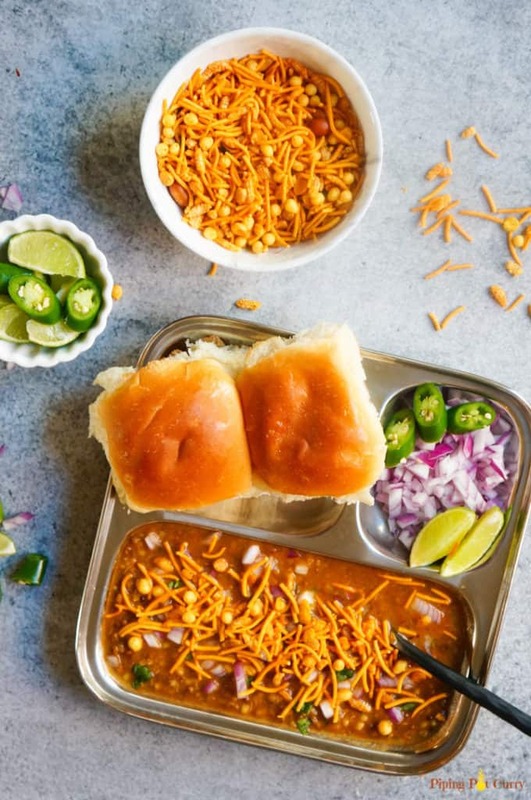 Misal Pav is one of them, similar to the Mumbai Pav Bhaji. To get the perfect and most authentic recipe, I learnt this from my close Maharashtrian friend Shweta. So you will certainly not miss the authentic flavors with this one-pot recipe in the Instant Pot. 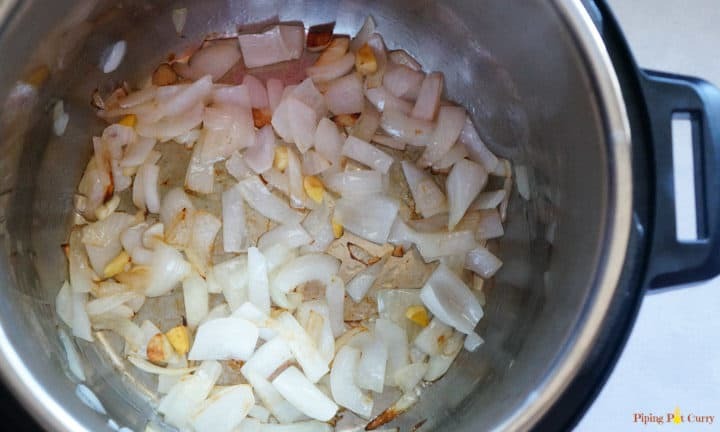 Toppings – onions, farsan and cilantro. There are also many local variations of Misal Pav. Mumbai Misal, where the sprouts curry (usal) and the spicy gravy (kat) are made together. This is the one we will make in this one-pot recipe. Other popular variations are Puneri Misal and Kolhapuri Misal. In these two variations, the usal and kat are prepared separately. Then while serving, they are mixed together as per taste. Kolhapuri is the extremely spicy version and Puneri is served with pohe (flattened rice). Misal pav can be made with only sprouted moth beans or a combination of sprouted moth, sprouted moong, peas and soaked black chickpeas. The method remains the same whether you use a single bean or a combination. 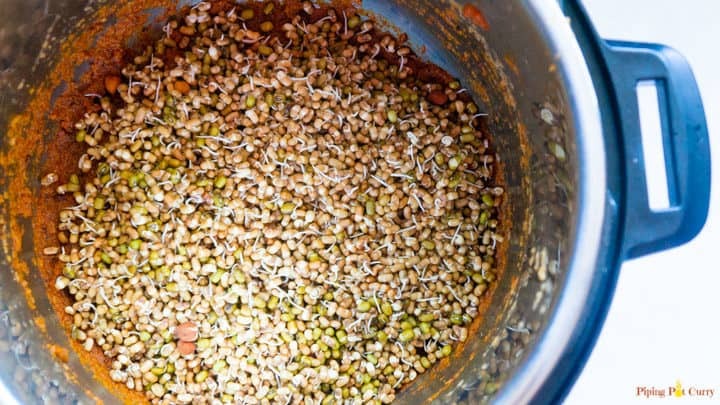 You can either buy sprouted beans or sprout beans by first soaking them for 4-6 hours in lots of water. Then removing the water and keeping them in a wet cloth for 10-12 hours or until you see white sprouts coming out. Instant Pot yogurt mode also works great to sprout beans. The sprouts are cooked in a onion, tomato, ginger, garlic and coconut sauce, with aromatic spices and lots of water. The water makes the kat/rassa, which is great for dipping the pav. We will make misal medium spicy in this recipe. You can make it as spicy or less spicy depending on your taste preference. 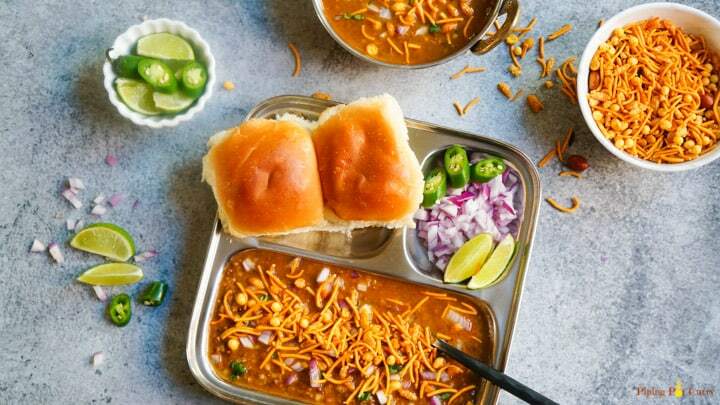 How to serve Misal Pav? The special thing about Misal Pav is the way it is served. Firstly the cooked sprouts are added to the serving bowl, then topped with diced onions, farsan and cilantro. Then the spicy liquid from the curry or kat is spread around the bowl. Serve with pav or dinner rolls. 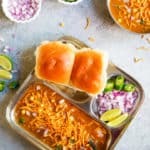 How to make Misal Pav in Instant Pot? We will start with sautéing the onions, ginger and garlic in some oil. Then saute with the tomatoes and desiccated coconut powder. 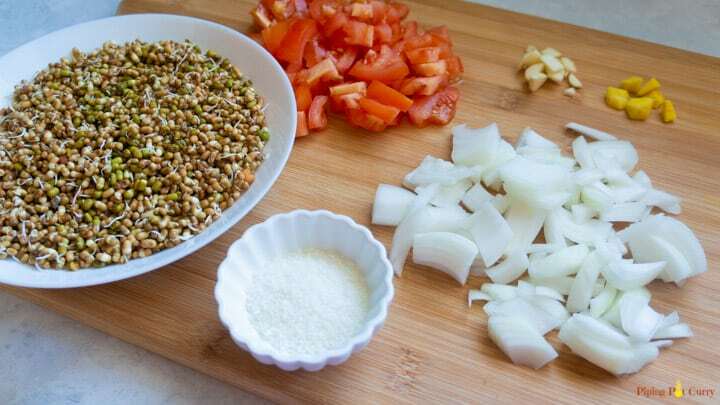 You don’t have to finely dice or mince these ingredients, as we are going to grind them. After sautéing them, transfer to a blender and grind to a smooth paste. 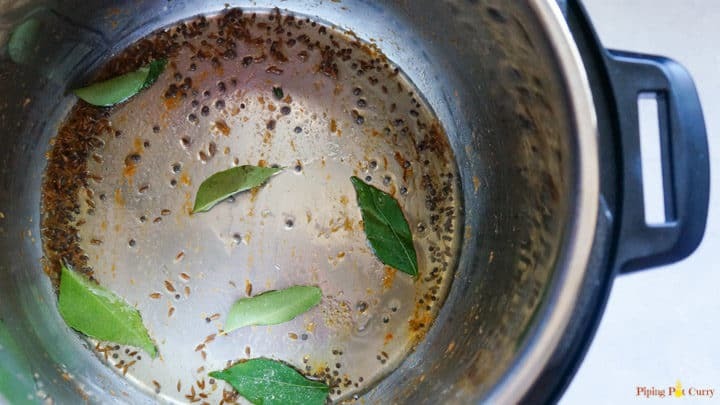 Now in the instant pot we will temper mustard seeds, cumin seeds, curry leaves in oil. Then add back the ground masala paste. Add the dry spices. The main dry spice is the misal masala. 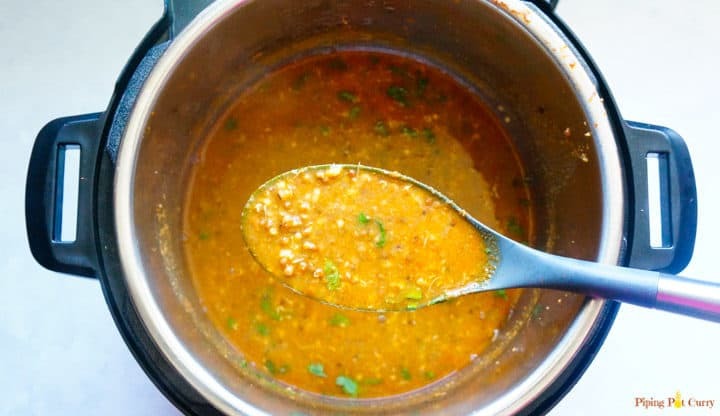 If you don’t have misal spice blend, you can replace it with Goda Masala or make it at home. The main difference between misal masala and garam masala is the addition of sesame seeds and dried red chili to the misal spice mix. I also like to add some Kashmiri red chili powder to get the bright reddish color to the curry. Then add in the sprouts along with ample water, and pressure cook the curry. After pressure cooking, stir in the lemon juice and chopped cilantro. Usal or Sprouts curry is ready. Check above for how to serve Misal Pav. We love the crunchy farsan on the sprouts curry. Dip the pav in the Misal and enjoy! 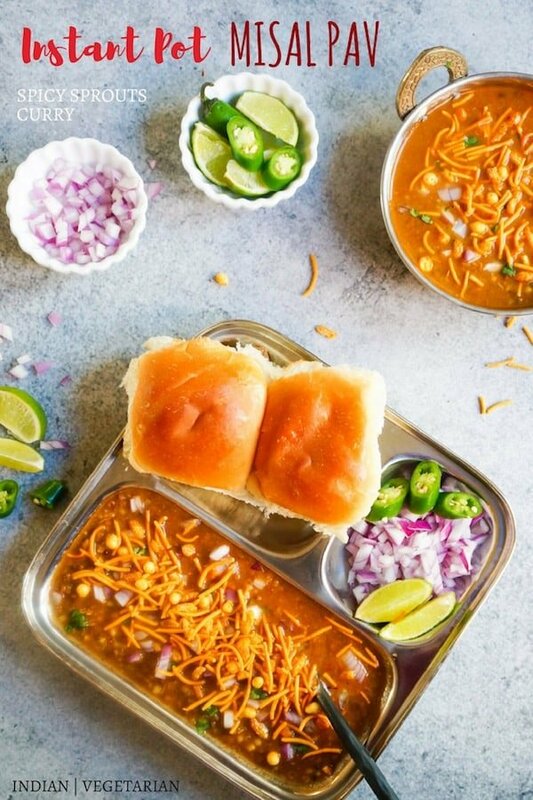 Try this easy Mumbai Misal Pav in the Instant Pot and let me know if how you like it. A delicious Maharashtrain breakfast, Misal Pav made as a one-pot recipe in the Instant Pot. Misal consists of spicy sprouts curry (usal) cooked with onions, tomatoes, ginger, garlic and coconut. This is then topped with diced onions, lemon juice, farsan and enjoyed with pav (dinner rolls). Start the pressure cooker in Sauté mode and let it heat. Add 1 tbsp oil, onions, ginger and garlic. Sauté for 3 minutes. Add tomatoes and sauté for another 2 minutes. Add the desiccated coconut and mix well with the onion-tomato masala. Turn off the pressure cooker. Transfer ingredients to a blender and blend to a paste. If needed, add 1/2 cup water while grinding. Keep aside. Start the pressure cooker in saute mode (Note: It is not necessary to clean the pressure cooker). Add oil, cumin seeds, mustard seeds, curry leaves and asafoetida. Let them sizzle for 30 seconds. 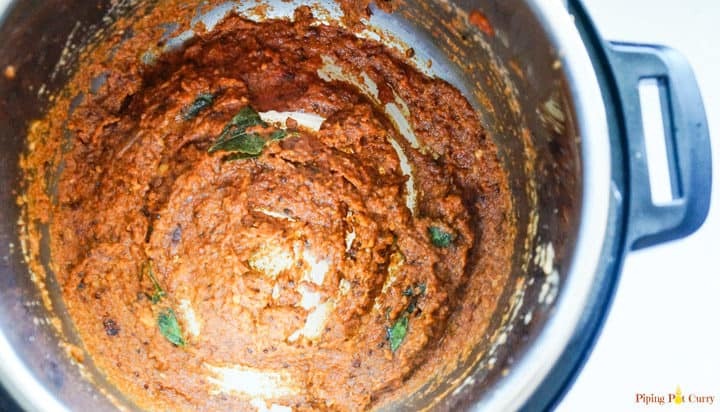 Add the blended masala paste. Stir well. Add the spices and mix well with the masala paste. Add the sprouts and water. Stir well. Press Cancel and close the lid with vent in sealing position. Start in manual or pressure cook mode for 12 minutes. When the pressure cooker beeps, let the pressure release naturally. Open lid and stir in the lemon juice and garnish with cilantro. In a serving plate, add the sprouts from the curry. Then top with onions and farsan. Add some rassa (liquid) from the curry around the farsan. Serve with pav (dinner rolls). Enjoy misal pav by dipping the pav in the misal curry. I used mixed sprouts in this recipe with both moth and moong beans. You can use either one or a combination with dry peas and soaked black chickpeas. Onions, Tomatoes: You don't have to dice them, as we are going to grind the masala after some sautéing. 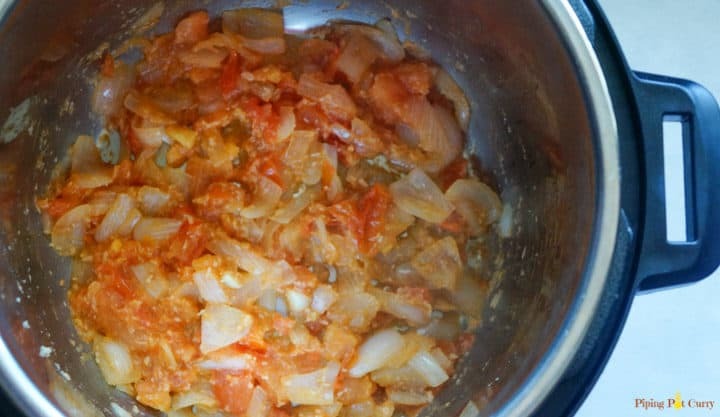 Easy method: If you are not particular about grinding the onion, tomato masala to a paste. You can just dice and add the tempering from step 5 before onions, ginger, garlic, etc and simplify the recipe even further. Misal Masala: If you don’t have misal spice powder, you can replace it with Goda Masala or make it at home. The main difference between misal masala and garam masala is the addition of sesame seeds and dried red chili to the misal spice mix. Misal is traditionally a spicy dish. I have made it medium spicy. Adjust to more or less spicy by adjusting the red chili powder. Farsan: The fried mixture or farsan is added right in the serving bowl, else it gets soggy and won't taste good. Hi do you mean 2 cups sprouts or 2 cups raw moth that is sprouted and becomes 4 cups of sprouts? I want to make this recipe today. Thanks.